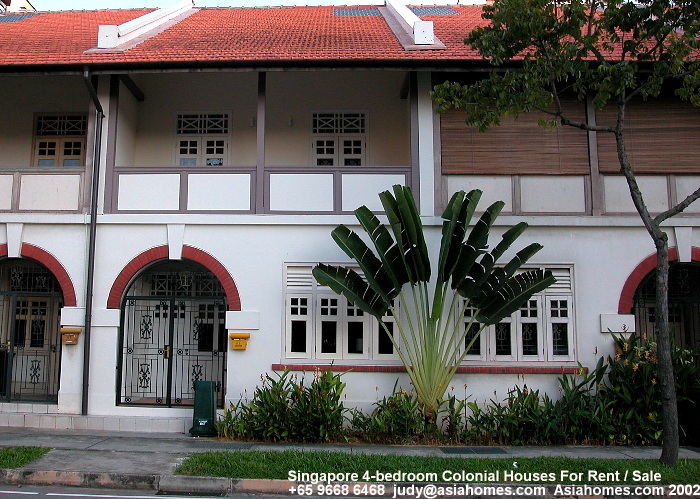 "Singapore servoced apartments, condos, house rentals for expats"
Downtown Singapore. 7 Orange Grove Road. 220 units. Serviced Apartments. Completed: 2000. It is an upmarket serviced apartment. 1, 2, 3 bedroom and penthouses. Min. lease 7 days. Low density, low rise, new and great location downtown. 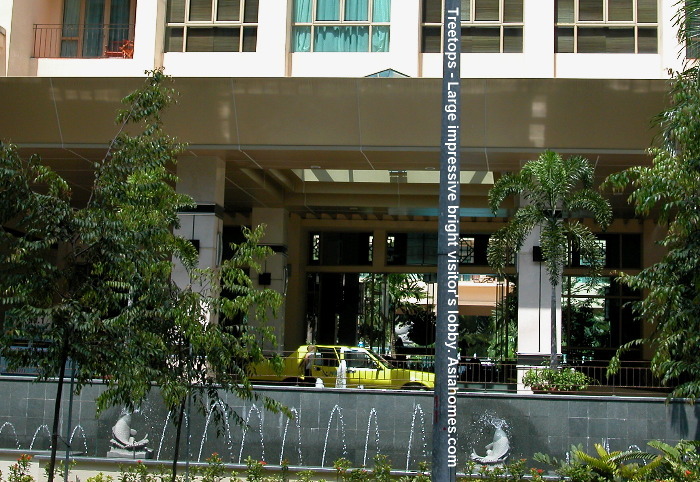 Picture shows the front of Treetops, fronting Orange Grove Road which joins Orchard Road in a 1-minute walk. 3-bedroom (1200 sq ft) $18,000 - $21,000. 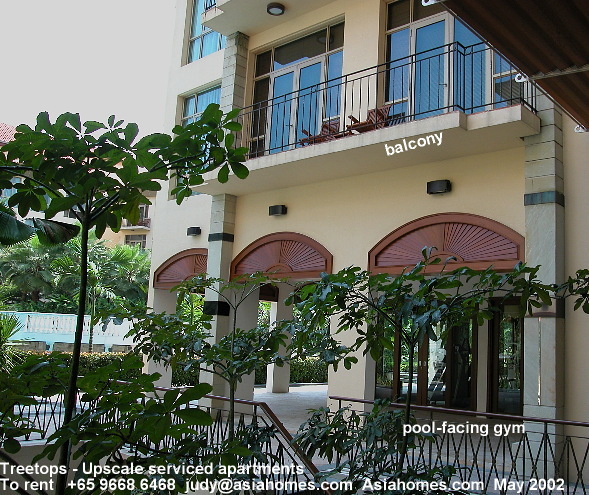 Some units have balconies and facing the inside garden, pool and courtyard. The areas of the balcony are 40, 60, 50 sq. 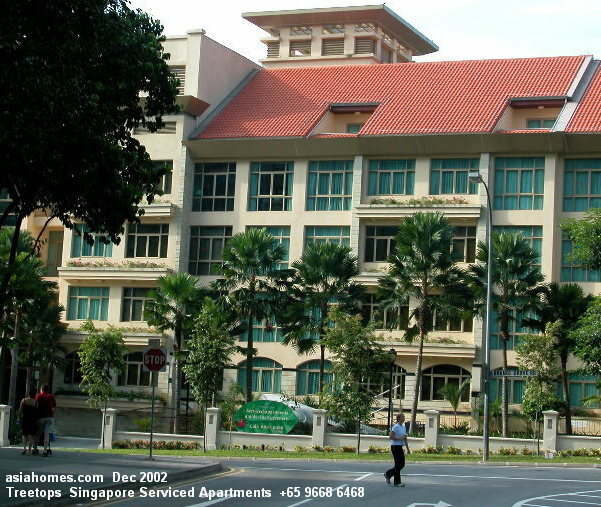 ft for the respective 1, 2 and 3 bedrooms. Daily housekeeping service (except Sundays and public holidays). Big resort pool, children's pool, outdoor jacuzzi, gym, tennis courts, BBQ pits, jogging track, outdoor fitness station, children's playground, sauna room, communal launderette. Broadband internet access. Palm trees, waterfalls and tranquility. 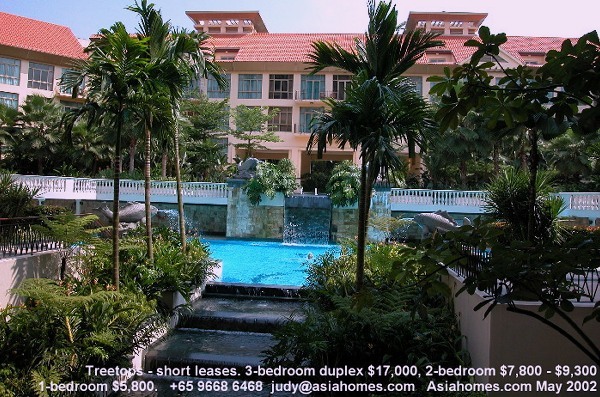 Picture shows units facing away from Orange Grove Road, the pool and the internal courtyard. They have small balconies of around 50 sq. ft. Rents are higher. 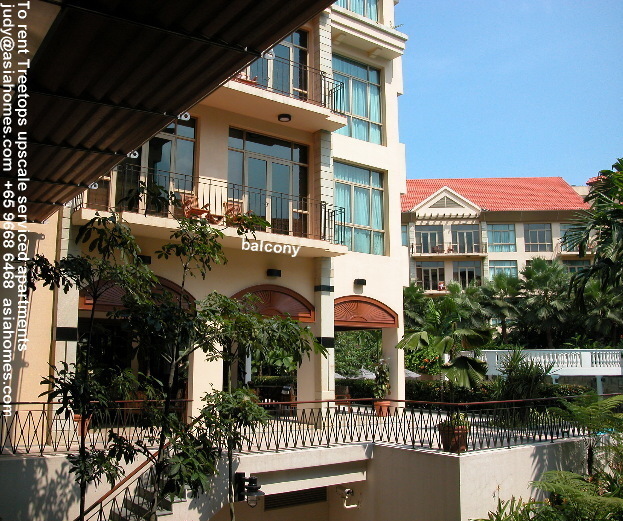 The gym is on the right, at the ground floor and faces the pool. Grand entrance to Treetops. To the left will be a one-minute walk to Orchard Road where there are pubs, food and beverage joints, a Jason gourmet supermarket, boutiques & 8-10-min walk to the Orchard subway, Starbucks, McDonalds, Burger King, Borders Bookstore & cinemas. Many taxis and buses. Suits expats who want upscale plus newer apartments in a high class leafy residential enclave of Orange Grove and Orchard Road neighbourhood. All houses here are multi-million dollars. The 2-bedroom units have 2 white long baths in black granite floors unlike most serviced apartments. However, ground floor units may not have shower stalls, depending on floor plans.